Happy the man who can endure the highest and the lowest fortune. He, who has endured such vicissitudes with equanimity, has deprived misfortune of its power. I’ll be Deplorable… If you want me to be. I’ll be Ignorant… If you want me to be. I’ll be Selfish… If you want me to be. I’ll be Racist… If you want me to be. I’ll be Sexist and Misogynist… If you want me to be. I’ll be Homophobic… If you want me to be. I’ll be Transphobic… If you want me to be. I’ll be Islamophobic… If you want me to be. I’ll be Xenophobic… If you want me to be. I’ll be a Fascist… If you want me to be. And, of course, I’m not being accommodating. Nor is this really just a paroxysm of sarcasm on my part, though it is heavily laced with sarcasm. I just accept that I’m going to “be” whatever your sort(s) decide that I am since you’ve developed, promulgated, and/or adopted such definitions of these terms that make it so that I am all of these things by your criteria. And therein is the sad truth. Americans’ domestic enemies operate within a framework of narrative and lived experience, not facts, and they created their “Liberalexicon” accordingly. Hence, I and the rest of us are in their minds exactly whatever bad thing that believe us to be. 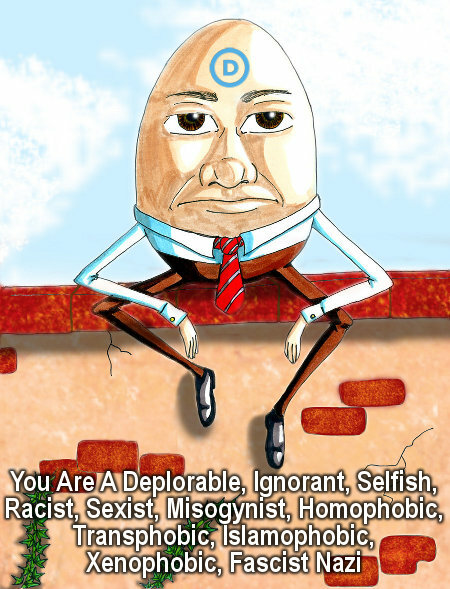 They’re the scions of Humpty Dumpty and When they use a word, it means just what they choose it to mean—neither more nor less. And, My Fellow Americans, remember that the majority of our people’s domestic enemies believe in these ever-broadening and ever-shifting definitions and, hence, truly believe that we are, each and every one of us, whatever “bad thing” that their specific hatred is pointed at any given moment. So they cannot be reasoned with since who could expect anyone to reason with or accept any argument from such deplorable people as they “know” us to be.